WE DON’T BELONG HERE. (DVD Artwork). ©Sony Pictures Home Entertainment. Dark family secrets are revealed in thriller “We Don’t Belong Here,” debuting on DVD and digital Tuesday April 4 from Sony Pictures Home Entertainment. Two-time Academy Award nominee Catherine Keener (“Being John Malkovich,” “Capote”) leads an all-star cast in the story of a matriarch (Keener) of a dysfunctional family who is pushed to her tipping point by the disappearance of her son. Filled with edgy suspense that mystery fans will appreciate, “We Don’t Belong Here,” also stars the late Anton Yelchin (“Star Trek” franchise), Riley Keough (“Mad Max: Fury Road”), Molly Shannon (“Divorce”), Maya Rudolph (“Bridesmaids”) and Cary Elwes (“The Princess Bride”). The dark drama was written and directed by Peer Pederson, produced by Annalise Dekker-Hernandez, Adam Gibbs, Michael Kristoff, Roger Pugliese and Peer Pedersen, Megan Griffiths, Lacey Leavitt, and Mary E. Quick serve as executive producers. “Rogue One: A Star Wars Story” will be available in a Blu-ray Combo Pack, DVD and On Demand Tuesday April 4. It also is available now on Digital HD. Although billed as a standalone story, “Rogue One” actually is an immediate prequel to 1977’s first “Star Wars” outing, setting up the events in that film. Jyn’s father (Mads Mikkelsen, who also appeared in last year’s “Doctor Strange”) tries escaping the evil Empire, but has been dragooned back to the dark side to design the Death Star, every nerd’s favorite weapon of mass destruction. His nasty superior Orson Krennic (Ben Mendelsohn) manages to be even more vicious than returning baddie Grand Moff Tarkin (the deceased Peter Cushing, appearing by way of CGI reincarnation). Where Krennic would be cool with destroying an entire planet as an initial demonstration of the Death Star’s capabilities, Tarkin settles for only a single city. Tarkin is one of several returning original-trilogy characters, including a final creative cameo. Directed by Gareth Edwards (who helmed 2014’s “Godzilla”), the screenplay is by Chris Weitz and Tony Gilroy. The home entertainment release includes never-before-seen “Rogue One” bonus material that will take fans behind the scenes with the movie’s diverse cast and team of filmmakers. An intimate collection of stories reveals how the film came to life, as well as hidden Easter eggs and film facts that audiences may have missed in the theater. 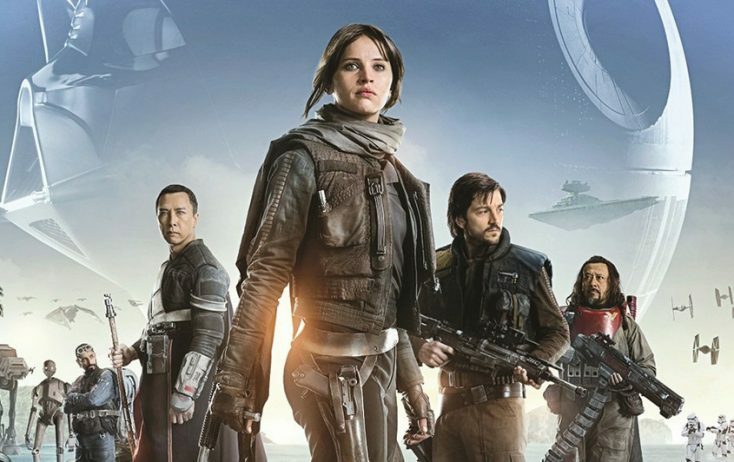 Among the bonus features: “A Rogue Idea,” in which ILM’s John Knoll explains how the movie’s concept was developed and why it’s the right film to launch the “Star Wars” stand-alone films; “Jyn: The Rebel,” in which viewers get to know “Rogue One’s” defiant, resourceful survivor, and hear what it was like for Felicity Jones to bring her to life onscreen; “Cassian: The Spy,” in which Diego Luna shares insights into his complex, driven character, who becomes a hero through selflessness, perseverance and passion: “Bodhi & Saw: The Pilot & The Revolutionary,” in which Forest Whitaker and Riz Ahmed reflect on Saw Gerrera, the broken Rebel leader, and Bodhi Rook, the Imperial pilot who defects and much more. Party like your job depends on it when “Office Christmas Party” arrives in a new unrated cut on Blu-ray Combo Pack Tuesday April 4, from Paramount Home Media Distribution. An unrated version is available on Digital HD. When an overbearing CEO (Jennifer Aniston, “Friends,” “The Good Girl”) decides to close her hard-partying brother’s failing branch, he (T.J. Miller) and his fired-up co-workers (Jason Bateman, Olivia Munn, Kate McKinnon) decide to throw an epic office party to land a big shot client and save everyone’s jobs. Fueled by booze and bad decisions, things quickly spiral out-of-control in one of the craziest nights of their lives. The comedy features a supporting cast of comedic talent including Rob Corddry (“Hot Tub Time Machine”), Jillian Bell (“Fist Fight”), Vanessa Bayer (“Saturday Night Live”), Fortune Feimster (“The Mindy Project”) and Courtney B. Vance (“The People v. O.J. Simpson: American Crime Story”). Extras include commentary by co-directors Josh Gordon and Will Peck, a how-to on “Throwing an Office Christmas Party,” outtakes, deleted scenes and more. The Blu-ray edition includes the unrated cut that was not previously released in theaters; the DVD includes the theatrical version. “Salt and Fire” is available Tuesday April 4 on VOD, from XLrator Media. The thriller revolves around a mysterious hostage-taking where the leader of a small scientific delegation is deliberately stranded with two blind boys in an area of gigantic salt flats. Shot in Bolivia, “Salt and Fire” stars Michael Shannon, Veronica Ferres and Gael García Bernal and was written and directed by Werner Herzog (“Grizzly Man,” “Into the Inferno”) and based on the story “Aral” by Tom Bissell. ‘Hunger Games,’ ‘Capital’ and ‘Badlands’ on Home Entertainment … plus giveaways! ‘Ghost in the Shell,’ Stan Lee Doc, More on Home Entertainment … plus giveaways!! !